Decathlon is quick to innovate. Yet, lessons learnt from these innovations are soon forgotten. In 2014 Decathlon introduced a foot cradle design in their trail running shoes. We found this to be an excellent innovation and singled it out in our shoe review. In 2016, Decathlon again innovated by adding quick draw shoelaces to their trekking/trail running shoes. Come 2017 and both these innovations are missing or scaled down in the latest summer/monsoon hiking shoes - Arpenaz 500 Fresh. Arpenaz is Decathlon's entry to mid-level trekking brand. Arpenaz 500 Fresh are top of the line Arpenaz hiking shoes. This means that they sit somewhere in the middle of Decathlon's 2017 trekking shoes lineup. I have to admit that Decathlon's quality control is impressive. I have never seen a missing stitch, adhesive overlap or frayed mesh in any Decathlon shoes for the past three years that I have shopped there. I'm happy to report that the build quality remains top notch for Arpenaz 500 Fresh too. Even after a close examination none of us could find anything wrong with our retail model. "Made for one-day lowland hikes, in hot weather and on easy trails. For regular use. Enjoy the lightness and breathability of these men’s hiking shoes, designed for day trips. They protect your feet and are very comfortable, even without socks." So what they mean is that we are sacrificing a robust build for low weight and high breathability. Yet these shoes meet their desired objectives with aplomb. Weighing in at 608 grammes for a pair in size 42, these shoes lie in the featherweight category. At 608 grammes these shoes are lighter than Salomon's SpeedCross 4 (616 grammes). Impressive considering that the Salomon cost 4 times as much. does not sit flush thus allowing scree and other debris to enter. A stripped down version of Decathlon's excellent foot cradle design trickles down to these shoes. Three diagonal stripes running along the sides are attached to shoe laces. These strips help keep the shoe snug against the side of the foot. However, one thing that I miss on these shoes is reinforcement. Last year's Forclaz Flex Helium had the right amount of reinforcement without sacrificing breathability or light weight. They were just 30 gms (10%) heavier than the Arpenaz 500. I wish Decathlon had added similar reinforcement to the Arpenaz 500, especially in key areas like the front and the heel cup. This omission is probably to cut costs or perhaps it is another lesson that is lost in the quick innovation cycle. Forclaz Flex 3 Helium is rugged thanks to the strategically placed reinforcement. It weighs 330 grammes as compared to Arpenaz 500 which weighs 304 grammes. I would prefer to have this reinforcement for Himalayan treks. Arpenaz 500 comes with traditional laces, a feature that is getting long in the tooth. Over the past couple of years, most of my trekking shoes have come with some kind of quickdraw lacing system. I have to admit that I was apprehensive about the longevity of the quickdraw system, but it has worked well so far. Today I find the quickdraw system to be more comfortable and quick. Although the "semi" foot cradle may be the reason Decathlon opted for traditional laces in these shoes yet it feels like "one step forward and two steps back". The diagonal stripes work well at keeping the shoe snug against the foot. We would have preferred two more stripes between the existing ones. Arpenaz 500's outsole is Decathlon's "CrossContact" pattern. In 2017 Decathlon has converged on the cross contact outsole for most of their trekking shoe lineup. We've been evaluating a cross contact Decathlon prototype for the past year or so far none of our testers has had a cause to complain. This confidence in "CrossContact" is reflected in the fact that even their top of the line Forclaz 600 come with the same outsole pattern. However, we wish they gave us deeper lugs (like Salomon does with their excellent Speedcross range). Most trekking trails in India are unpaved and muddy. 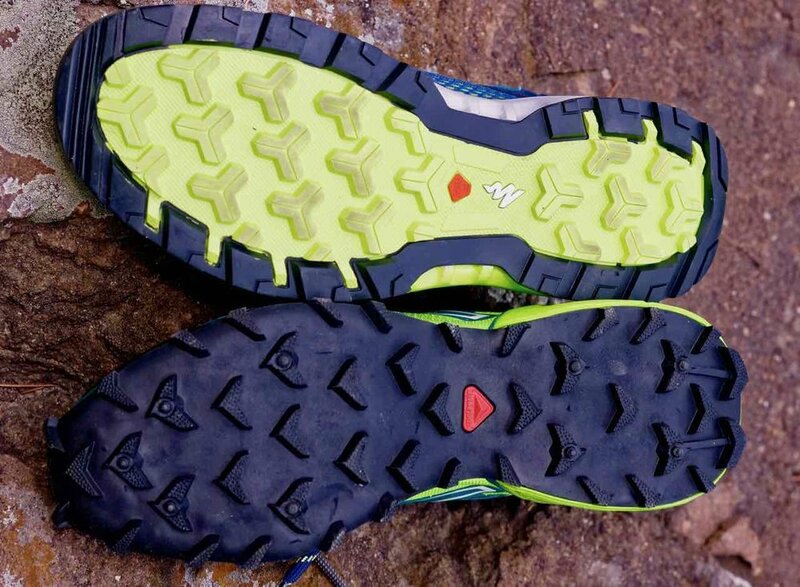 Bigger, more aggressive lugs offer better grip in wet, slippery mud. Note the bigger more aggressive lugs on the Salomon Speedcross (bottom) as compared to Arpenaz 500 (top). 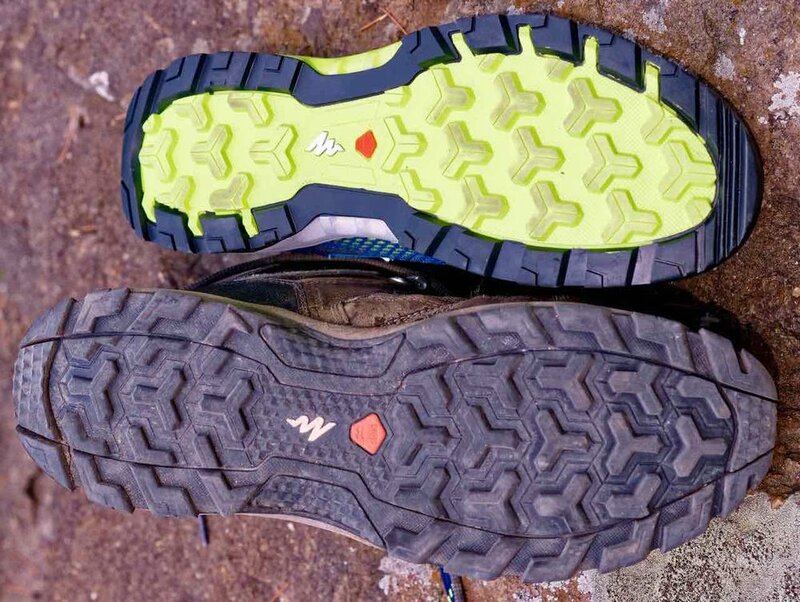 We wish Decathlon experimented with bigger lugs on its India specific hiking shoes. The outsole features a faint instep. I really wish this instep was deeper and better defined because in it's current avatar this is barely gaiter-compatible. When wearing gaiters, the under shoe strap does not touch the floor, yet there is only a hair width of clearance. I wonder if the testing team at Decathlon ever tests their hiking shoes with gaiters. These shoes come with a perforated sole to efficiently evacuate water. 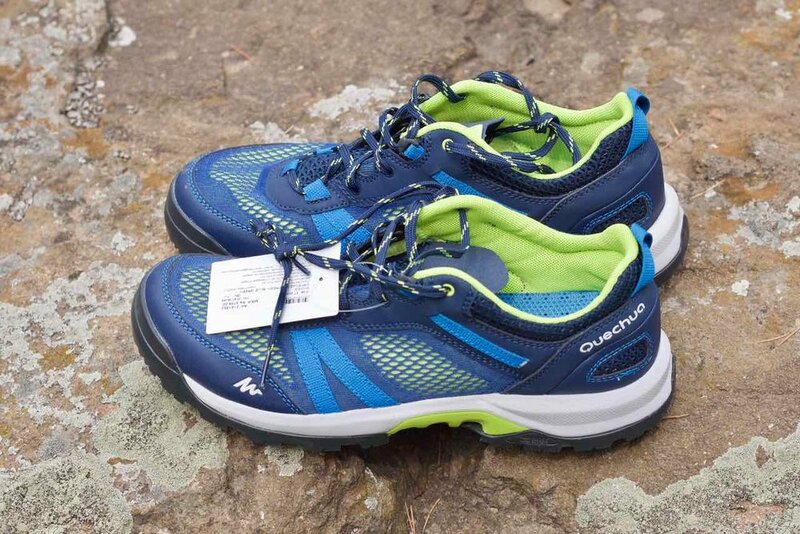 We will be evaluating this in our field tests when we take these shoes up and over 4000 m at Gaumukh (Uttarakhand). I have long maintained that there is no such thing as a waterproof shoe and given enough water every waterproofing will fail. In a wet situation, I prefer swimming with the current rather than fighting it. This means I prefer a shoe that vents well and dries quickly rather than one that takes a long time to get wet yet once it is wet, takes ages to dry. Given the huge amount of mesh on this shoe, I belive it should act like the former than the latter. Besides the perforated sole, the insole is perforated and removable as well. This should further help these shoes dry off quickly.